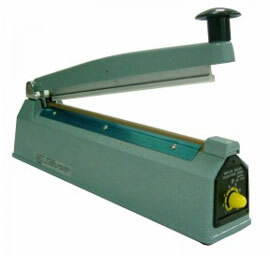 Sturdy low-priced impulse sealers from China for perfect seals. We ourselves enjoy working with these machines. Sealing time: 0 – 1.5 sec, all with CE-approval. Useable for PE-bags up to 2 x 0.3 mm, aluminium bags up to 2 x 120 µ. 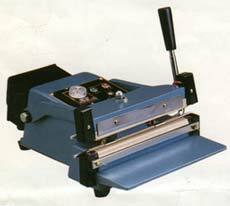 These sealers also can be used with round wires 0,6 mm for simultaneous sealing and cutting. If this is your application just order some round wires along with the sealer. Round heating wires as well as other spare parts are available for all sealers. Generally all models and spare parts are kept in stock! High sealing capacity. Particularly suitable for aluminium barrier films and other composite films. Less suitable for PE films. Accessories for table top sealers Wusing (working tables, unwinders) - please click here! 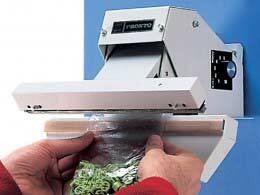 Extra long impulse sealers, usable as table top or hand held device, seal width 2,7 mm. These sealers also can be used with round wires 0,8 mm for simultaneous sealing and cutting. If this is your application just order some round wires along with the sealer. Round heating wires as well as other spare parts are available for all types of sealers. Teflon sheet 230 x 300 mm, 2 pcs. Sealing wire 10 x 230 mm, 2 pcs. Designed to seal plastic bags. Once a bag is filled, it is placed between the sealing bars. With a simple push on the sealing bar, the bar will close and the sealing cycle will start. During sealing time a control light indicates the cycle. 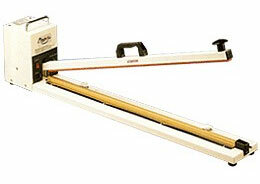 Polystar table top sealers, hand operated. 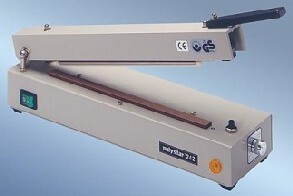 Impulse sealer with variable heating time for all PE, PP and PA films up to 2 x 2,5 mm. Yellow control light. CE-approved. Accessories for table top sealers Polystar (working tables, unwinders) - please click here! Polystar 242, Polystar 243 and Polystar 423 are also available with a cut-and-seal wire.